Greetings from Michigan! I’m a little bummed to report that there is NO SNOW! And here we packed allll these mittens and scarves and snow pants. Ah well! It’s really fun to be back home with the family. 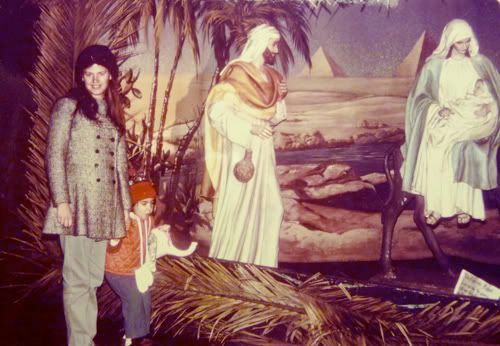 Christmas has always been a special holiday for us, and my mom has always decorated the house awesomely. I wasn’t sure we were going to be able to make it back this year (airline prices are sky high, especially for a family— it’s so sad) but working a little extra harder and taking on some additional freelance work this week, we were able to make it happen! 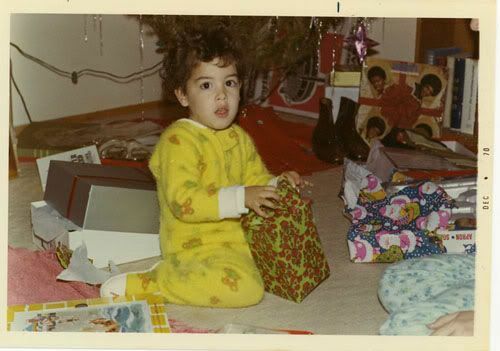 Since I love to share vintage photos, I thought it would be fun to share some of my own “retro” holiday pics. It’s a random assortment of photos—most of the albums back home in Michigan at my parents’ house—but here are a handful of my memories! In these photos I’m wearing an awesome hot pink knit dress that was hand made by my Tante Judy (my godmother), who was super crafty. I believe we are at my grandma’s house here. On the left is my Uncle John and my cousin Lisa. I’m pretty sure this next one is the same year, but at our own apartment at the University of California, San Diego married student housing. 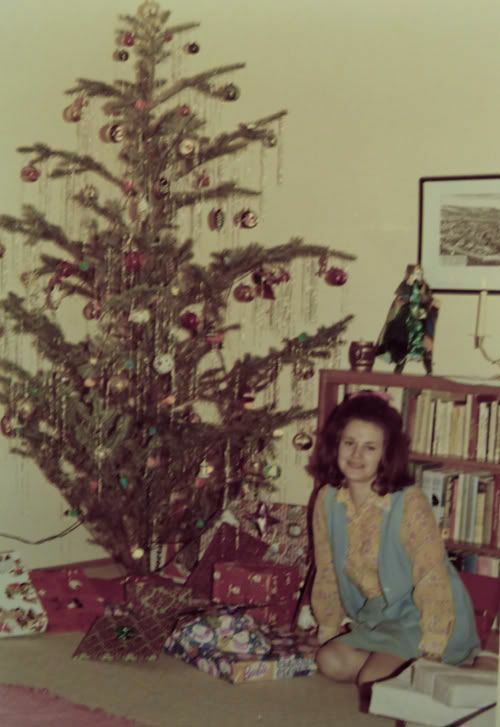 That tinsel is very German—although I noticed it on the tree at my grandma’s house (in the first photo), so maybe it was popular in general in the 70s. 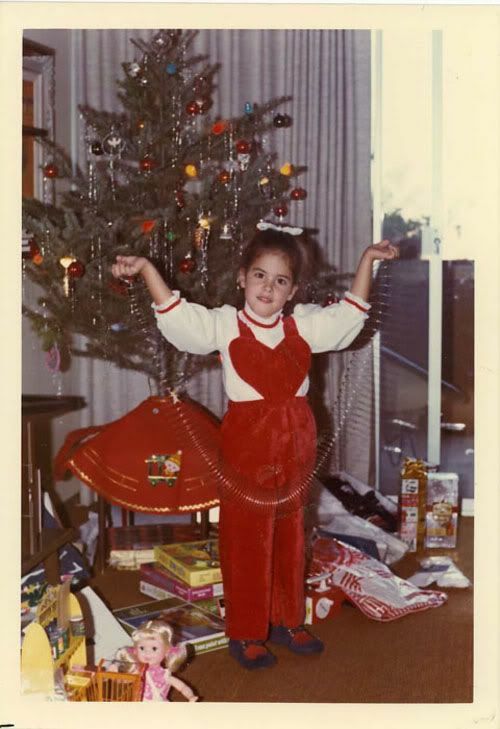 Do you remember tinsel on your tree back in the day?? I rarely see it on trees any more. My sweet friend Lishy Loo sent me a few packs last year! 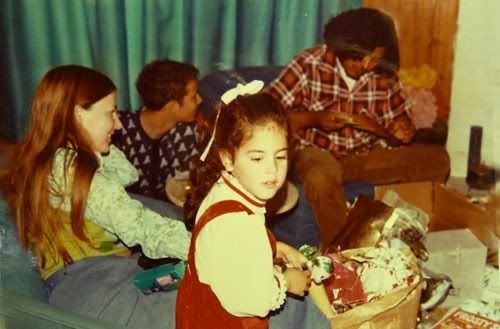 In the background you can see my Top Favorite Christmas Album of All Time—The Jackson 5 Christmas Album. We still have it and I listen to it every year! Michael Jackson singing “Up On the Housetop” is my all-time favorite. See? Told ya I was smitten with my carriage! It looks like the one in my Sears Catalog post. This is later in the day, and I’m all dolled up. Check out the cool Playskool giraffe in the background. I sooo wanted one of those for Wolfie when he was little! I got the shutterbug early! Here I am with my little Fisher-Price Camera. I love this next photo. My mom looks like a modern day hipster here, with her groovy fur hat and cool coat. I’m holding Pinkie, my little pink elephant. 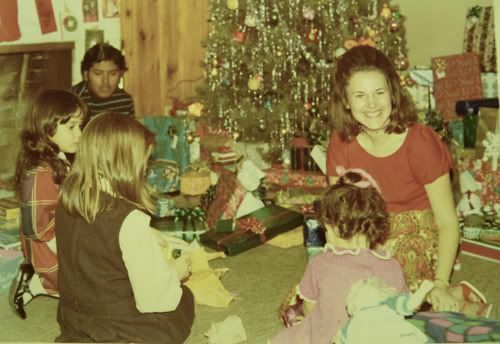 My godmother (she of the craft hand-knit pink dress) made him for me and he had these amazing psychedelic fabric ears. We’re at Balboa Park in San Diego. 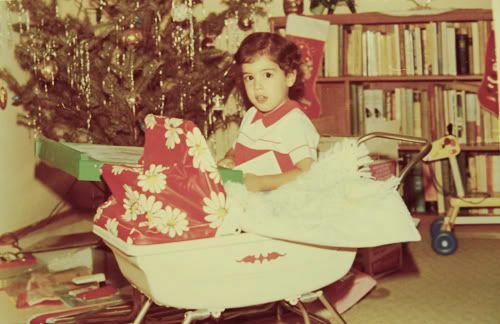 My mom has great style and I have always loved the little outfits she dressed me in—check out these red velveteen overalls with the heart bib! I even had red hearts on my lil blue suede shoes. I have to confess though, I was such a girlie girl I hated to wear pants. I was allll about the dresses. 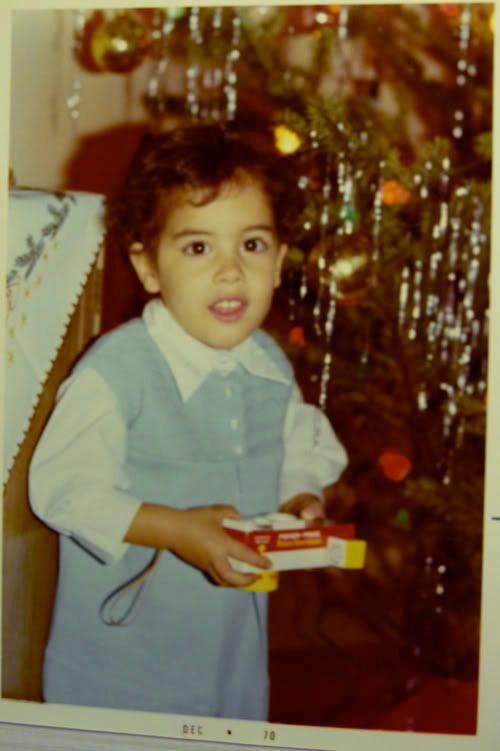 In fact, my mom reminded me, “It was SO hard to get you into that little outfit!” I do seem to remember that I was pleased by the red velvet trim on my ruffly shirt. Hmmm. OK, here we are at my Tante Anneliese’s house (my mom’s sister). 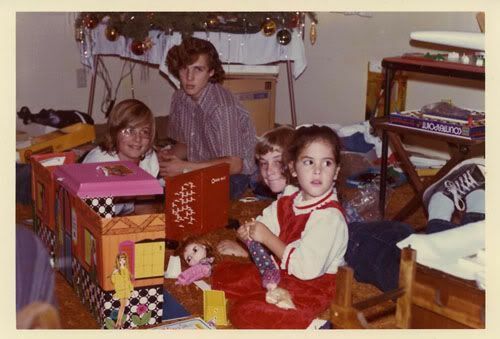 The year was 1973, and I got a little red headed Blythe doll AND the Barbie townhouse. Twas an excellent year of presents for wee Alexandra! Those are my three cousins in the back Danny, Rudi and Jimmy. Danny and Rudi were rockin’ the long California Boy hair. EMERALD THE WITCH! Remember, from my Creepy Cool Dollies post?? I was fairly certain I had an Emerald doll, but honestly thought it might just be wishful thinking. Proof positive I had her! OK, now we travel across the country to Flint, Michigan. This is Christmas Eve, which we always celebrated with a night of music/singing and some tasty little finger foods. We also got to open up presents that were sent to us from relatives (packages from Germany and California). 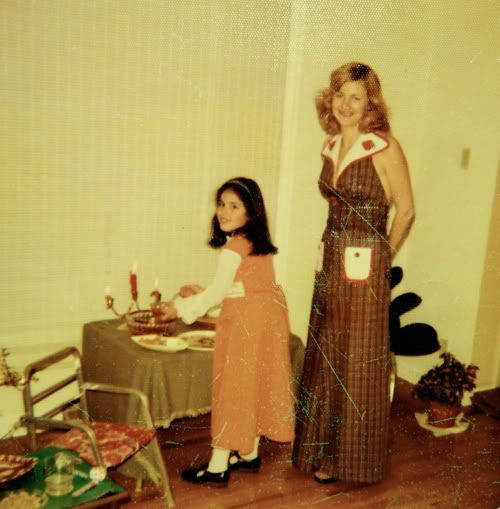 Look how adorable my mom is in her plaid, maxi dress—there are strawberries appliques on the collar. Cuteness! That chair on the left was from a little kinder set my folks picked up in German (it had a matching table that believe we are using as a small buffet!). The table and chairs were covered in a cool vinyl/plastic that had hot pink, red and orange flowers on them. The best part was (Dottie, are you listening??) I HAD MATCHING CLOGS! Oh yeah….. These pictures totally make me smile. 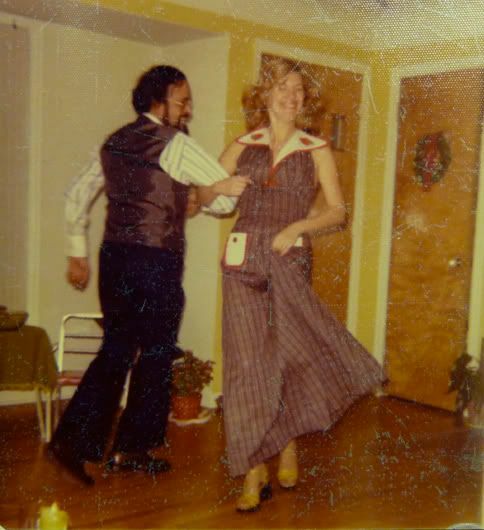 Check out how fun my parents are cuttin’ a rug Christmas eve! I look at our little house and there’s hardly any furniture. My dad was a young college professor and it’s not like he made a bundle, but as kids we were never aware that times might have been tight here and there. My parents are awesome. 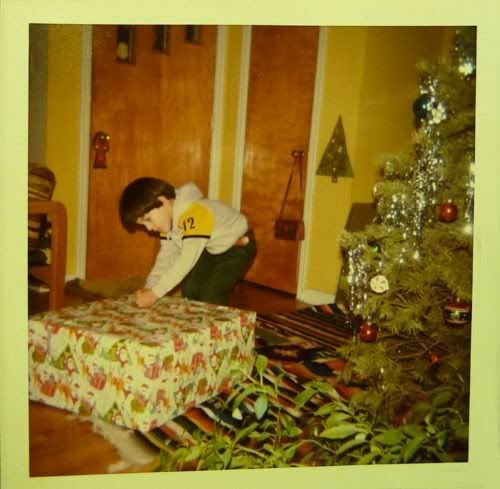 This is my brother Karl opening up his big present that year…a drum set! 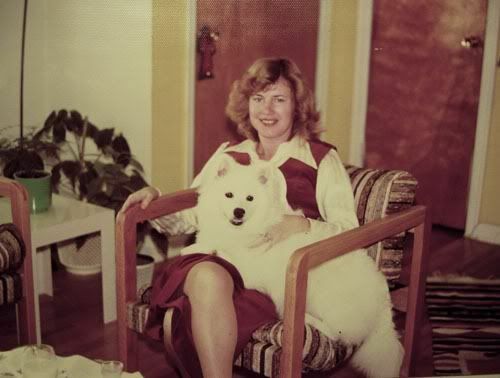 And finally, this is my mom with our dog Flockie (loosely translated it means “little snowflake” in German). I always loved this photo of her. She is wearing a velveteen gaucho suit, with a velveteen vest. I remember thinking she looked so glamorous with her Charlie’s Angels hair! 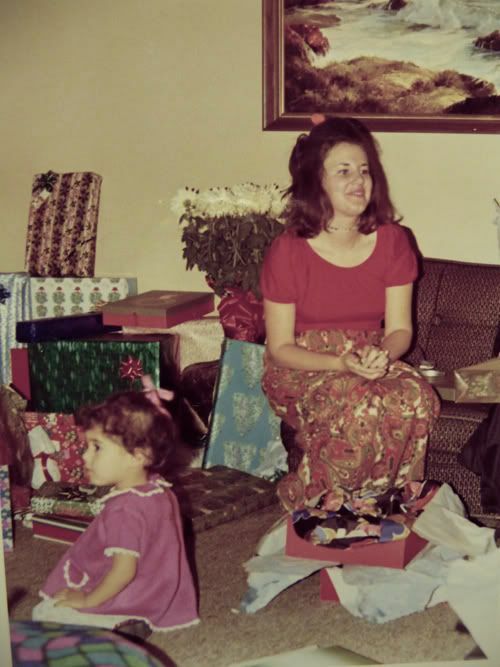 I was always very pleased and proud that I had a “pretty mama”. Growing up in Michigan in the 70s, most of the mom’s wore polyester stretch pants and had androgynous short hair cuts. Not my mom. My mama had style! So that’s my little trip down memory lane. I’ll have to try and get some more photos scanned. It’s so fun to peek at the past. And finally…..did you download my Retro Holiday Music Mixes?? What did you think? (YES i’m totally fishing for compliments, haha…..) I’m still plotting this week’s mix, so you’ll have another round of tasty vintage tunes to play while you are puttering around the house these final days! you are too darn cute ALex!! and we ALWAYS had tinsel on our trees in the 70s! Ditto on the tinsel. The cats ate it, which made cleaning the litter box festive! That maxidress is sweet. I liked having a “pretty mom” too. The pressure’s on me now, with my little Molly, and I’m not sure I’m up to it. thanks so much for saying that elizabeth! so glad you like ’em…. Hello, those mixes ROCK MAH WORLD!!! And girl, you had me at matching clogs! Well, the whole post is fabulous! I’m so going to go through my parents pix since I’m here in Boulder. Hee hee! cute photos Alix!!! what a lucky girl getting all those cool toys! Love these photos. We grew up in the same era. 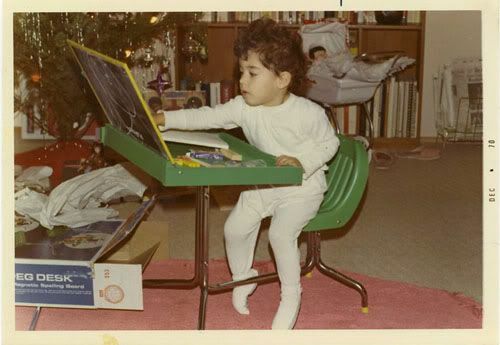 I got that EXACT little green desk in I think around 1972 or so.